Lovely Studio, Sleeps 5, 1 bath, full kitchen. Easy access to Manhattan. Beautiful marble bathroom with tub and shower. Very nice and close to the subway. Overall everything was nice and clean. The heaters worked really well. This apartment is on the second floor which came as a surprise. Getting used to all the noises out side took a little time. Totally recommend this place and would be willing to go back again as well. Translated from French to English by Google Translate. This property seemed like it would be great. The pictures looked good and there were many good reviews. When we got to the property (an hour early), the cleaning lady let us in and said she would hold our luggage, which was great. Check in was at 12pm, so we walked around for a bit and got back to the place around 12:10. She was still not finished with the room and had her crying children with her while she was cleaning. Meanwhile the man downstairs was shouting at the children to be quiet. Not sure if he's a neighbor or another guest. We waited another 10 minutes and then she came down and said it was ready for us. The property was not clean, there was thick dust around the baseboards and there were 2 dirty rags in the bathroom leftover from the "cleaning". The bathtub had grime and hair and didn't look like it was cleaned at all. The towels they gave us were dingy. The sheets and comforters looked like something out of a 90s dorm and didn't smell or look clean. We woke up at 4am to scorching heat from the radiator and were unable to control temperature so we had to turn on the window AC unit and open the windows while it was 30 degrees outside. He did answer when we called at 4AM, but was unable to do anything about it. This apartment is one of our most requested rentals and a favorite of our guest. It’s always well maintained and very clean. We always try to accommodate our guests, that's why the guests were allowed to drop off their luggage an hour before they were schedule to arrive. The cleaning lady is new and may have overlooked some things. We did correct that. We do have a new heating system that works very well. We adjusted the thermostat to turn down the heat to a more comfortable level. This is a family oriented building. We are always very friendly and helpful to our guest. I do apologize to our guest for any inconvenience. We appreciate your feedback. It allows us to constantly work on improving our service and making our guest's experience better. Very Clean and Updated Property, quite area close to subway and shopping. Checking in was very easy. The property manager was very attentive with any questions we had. Would stay again, have recommended to several friends. This clean and cozy apartment was a great resting spot for my family of three. The kitchen was well stocked and clean. The beds were comfortable. We used the futon too so that came in handy. 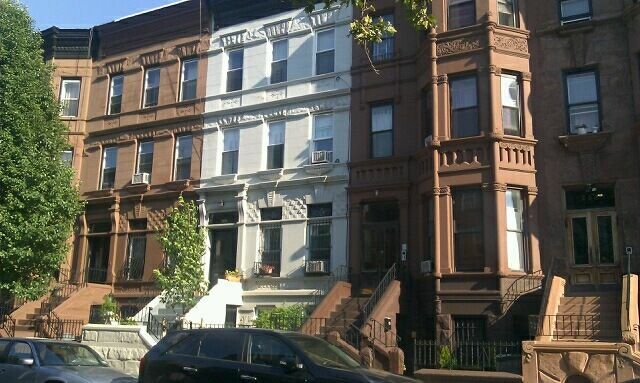 I loved the classic brownstone lined street. The apartment was in a convenient location to the subway and grocery store. The welcome book was very informative and helpful. We had two issues that influenced my decision not to give 5 stars. One was that there was construction of some sort going on in the apartment next door the first two days. We were coming in after a red eye flight so it made it hard to take a much needed nap the first day. After that it wasn’t so much an issue because we were out but it might be a good idea to advise the guests of this. Second we came home to the apartment the second day to a strong smell. It smelled like marijuana. I wouldn’t blame this on the owners as it was probably another guest or a worker but it did take away from our experience. All in all except for those two issues we enjoyed the apartment and our time there. I would rent it again as long as the construction was finished. We were doing some upgrading in one of the other apartments. (painting and plastering). We are always thriving to make things better for our guest and family. It didn't last long, but we apologize for the inconvenience. We do not allow any type of smoking in the building. We do have a tenant that sometime like to burn incense or sage to give their apartment a fresh smell. Maybe that's what you were smelling. Thank you for your feedback. It help us make your stay good, better, the best.